The recent appointment of ‘Baroness’ Sayeeda Warsi to the post of Minister for Faith and Communities served as a reminder of one of the significant flaws in the current democratic system in the UK: an unelected and unaccountable House of Lords. The fact that Warsi is a member of the second chamber has enabled Cameron to bestow upon her ministerial responsibilities, and for Warsi to make policy without any democratic mandate. This represents the very worst sort of tokenism and ‘positive’ discrimination, yet it is not this in itself that prompts the writing of this piece today, but rather what Warsi has signed with the Organisation of Islamic Cooperation (OIC). The National Secular Society notes that Warsi has this week signed a Memorandum of Understanding (MOU) between the UK and the OIC at the UN, which declares that the two will “work together on issues of peace, stability and religious freedom.” Those of you who are aware of the activities of the OIC, will know that this body of 57 Muslim states is attempting to introduce a global blasphemy law which would make it illegal to criticise or to satirise Islam in any country. Knowing of the penalties imposed by Islam for blasphemy, this is a chilling and deeply worrying prospect, as is the fact that this seemingly is not a matter of concern for Warsi. 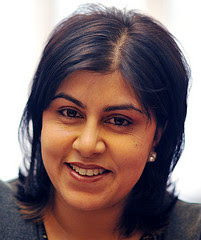 Moreover, as well as being Minister for Faith and Communities, Warsi has also been given an influential role as Senior Minister of State at the Foreign and Commonwealth Office that makes her "the lead minister responsible for Pakistan, Afghanistan, Bangladesh, Central Asia, the UN, the International Criminal Court and the OIC". Given her domestic and foreign affairs briefs, she could perhaps be more appropriately dubbed the Minister for Internal and External Muslim Affairs, for this is, in effect, what she is. We are all for co-operation between nations to try to foster peace and understanding, but the concept of 'religious freedom' is one that the OIC has distorted to mean restrictions on free expression. We hope that by signing this document the UK will not in any way compromise its commitment to human rights – particularly the human right to free speech. The British Government has been steadfast in its opposition to the OIC's blasphemy proposals up until now. We hope that this document will not change that in any way. Sanderson also noted how blasphemy laws were being used in some OIC states to “suppress Christianity and other religions in a brutal and merciless fashion” and singled out Pakistan for particular criticism on this score, whilst noting that in Egypt accusations of blasphemy were being employed to destroy political opponents. As Warsi is a Pakistani Muslim who has made clear her distaste for secularism, should we not possess legitimate concerns about her warm embrace of the OIC? That she possesses political office of any sort is not only an indication that our democracy is in need of democratisation, but that if it is not reformed our basic freedoms and liberties could be imperilled through the actions of appointees such as Warsi who hold values clearly at variance with those that we have long held dear. Sayeeda Warsi: in favour of a global blasphemy law? She is the fifth columnist in our willing goverment of appeasers. Where is our Churchill?? Churchill is long dead, but a politician with an objective rational perspective would do. She is nothing more than a 'Trojan Horse' for her more 'radical' friends.......Buyer beware! Do you think that she might get on well with Shahid Malik socially? Their statement makes me laugh, since when has islam or it's mad-muslim followers ever believed in peace and freedom? This woman will do whatever it takes to turn this once great country into a muslim hell-hole. She must be removed from office at once! What on earth is Cameron thinking? Cameron may be well polished, but his education is lacking in a number of key respects. What is he thinking? He alone knows. What is Cameron thinking? A very good question. 'Call Me Dave' does not think about anything political to any great depth. This vacuous PM is only interested in his own popularity and image. The slippery chancer really believes that Islam is a nice touchy feely religion which we should all embrace and that anyone who has the temerity to criticise it is a racist bigot. I think that you're right in noting Dave's less than realistic perception of Islam and his readiness to stigmatise the rest of us as bigots and racists.